Originally published by Marissa Gebhard at news.nd.edu on February 23, 2016. ND Energy is pleased to share the following news story from the American Chemical Society announcing the launch of its new journal ACS Energy Letters, focusing on rapid communication of research from across the energy field, including energy capture, conversion, and storage. 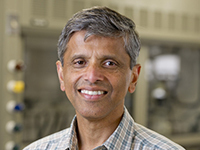 We are especially delighted that Dr. Prashant Kamat, John A. Zahm Professor of Science and ND Energy Faculty Fellow, will serve as the Editor-in-Chief. Please click here to view the ACS news story.